It’s not the first time the Charleville Lodge Hotel has done something controversial. Remember when they told Garth Brooks fans to ‘get a life’? NOT REGISTERING WITH Irish Water? 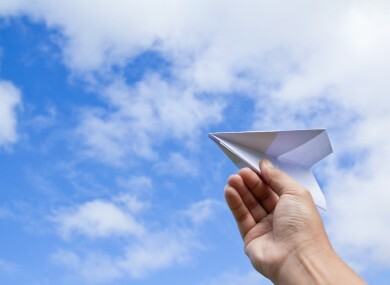 Good at making paper planes? One Dublin hotel is offering a 50 per cent discount for customers who show up with their registration form for the utility. “You need to be imaginative with your airplane though. I don’t want any lame attempts! You need to book either over the phone 01 8386633 or by email info@charlevillelodge.ie. Don’t forget to mention you are in possession of an Irish Water airplane at the time of booking. The post went up on Monday evening, and has so far racked up over 1,200 ‘likes’. You might remember — the hotel was also in the news last year. Management had to apologise for getting peoples’ hopes up that the cancelled Garth Brooks gigs were going ahead. They said they had been contacted by Aiken Promotions after posting a status saying that they had received word that the the country superstar’s gigs would take place. That initial status was shared over 100 times, but within hours, was proven to be false. Their apology to Brooks fans ended it with a not-particularly-conciliatory “you might want to get a life though”. Email “Dublin hotel offers 50 per cent discount for people who don't pay their Irish Water bill”. Feedback on “Dublin hotel offers 50 per cent discount for people who don't pay their Irish Water bill”.